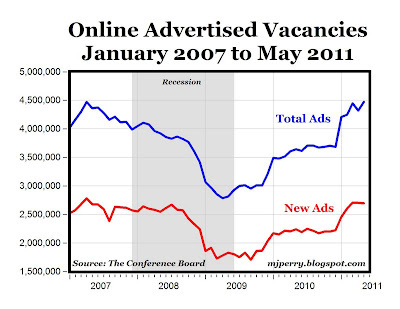 "Online advertised vacancies were up 148,800 in May to 4,471,200 according to The Conference Board Help Wanted OnLine Data Series released today. The May increase follows a decline of 124,000 in April and a gain of 198,000 in March (see chart above). In April 2011 (the latest unemployment data), there were just over 3 (3.18) unemployed for every advertised vacancy, in contrast to the 1.5 unemployed for every vacancy in April 2007. Labor demand is still uneven across occupations. Although demand in most occupations has picked up, with 6 of the 22 major occupation groups reaching all-time highs this month (computer science, art/design/entertainment/sports/media, building and grounds maintenance, personal care, sales and transportation), others are slower to rise and the demand for workers in legal occupations has stalled." Just wondering: How much of the inability to fill those vacancies is due to extended unemployment benefits? this is a meaningless number. mark, you yourself have posted articles about how emplyers cannot find the skills they want to fill positions. an opening in semiconductor design does an unemployed roofer ZERO good. we are now reaping the bitter fruits of our terrible immigration policy. we are sending home all the foreign engineers that got their education here. 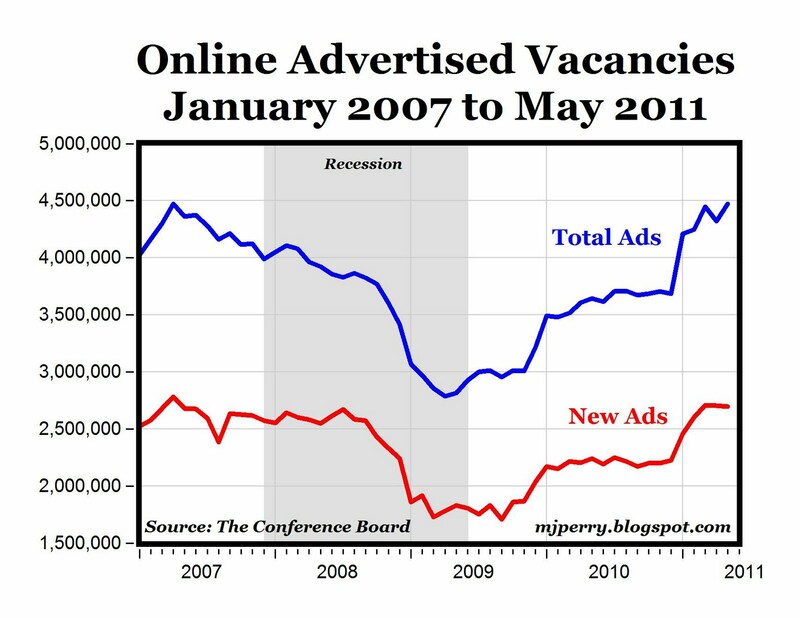 this trend of job openings has been headed up forever. meanwhile, initial claims are heading back up and the ADP job number was absolutely appalling. all the data is running in the opposite direction of this metric. that makes it pretty clear that these openings are not turning into hires. regarding andy's point, i'm sure that increased unemployment benefits are having an effect, but i doubt this is so at the high end. if you are used to making $100k+, unemployment benefits are not going to look that attractive to you. i suspect that a great deal of it is being driven by housing. housing starts are at post war lows even before adjusting for population. that puts a meaningful portion of people chronically out of work. that industry will not recover for years and you can't retrain most roofers to build java aps. i'd be interested to see the employment numbers ex housing related workers. I wish those figures would exclude the fake software developer ads.